Focusing on the general public, an often-forgotten key player in the debate on correct and proper English usage, this dissertation provides a current perspective on attitudes towards fourteen usage problems, including literally as an intensifier and the notorious split infinitive, in British English. 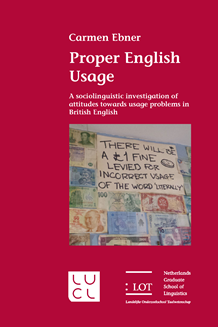 Proper English Usage investigates the impact of the social variables age, gender, language nativeness and level of education on attitudes towards the usage problems investigated. The results of various attitude elicitation tests, including an online questionnaire completed by 112 respondents, have shown that social variables such as age play a crucial role in the social stratification of usage attitudes. Using a mixture of different attitude elicitation techniques has shown that both subconsciously and consciously offered attitudes need to be taken into account in order to circumvent the issue of obtaining socially desirable answers. Besides applying a mixed-methods approach, qualitative and quantitative attitudinal data contribute further to a fuller picture of current usage attitudes. A historical dimension is added to the study by exploring the Hyper Usage Guide of English (HUGE) database, which allowed for a systematic assessment of percept data found in advice manuals spanning 240 years. The research for Proper English Usage was carried out as part of the ‘Bridging the Unbridgeable Project: Prescriptivists, Linguists and the General Public’ at Leiden University Centre for Linguistics.